Storage scald has been a serious concern for apple growers for as long as apples have been stored and marketed commercially. Susceptibility to this storage disorder varies with the variety of apple, environment and cultural practices. Granny Smith, Rome Beauty, Delicious, Winesap and Yellow Newtown are very susceptible, Gala and Fuji are moderately susceptible. Incidence and severity of storage scald is favored by hot, dry weather before harvest, immature fruit at harvest, high nitrogen and low calcium concentrations in the fruit, and inadequate ventilation in storage rooms or in packages. 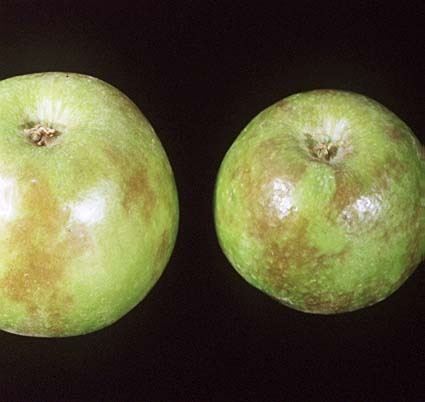 Irregular brown patches of dead skin which can become rough when severe, developing within 3 to 7 days upon warming of the fruit following cold storage. The warm temperatures do not cause the scald but allow symptoms to develop from previous injury which occurred during cold storage. Symptoms may be visible in cold storage when injury is severe. In this case, the symptoms intensify upon warming the fruit. Scald is usually not evident until after 3 months of storage. Storage scald can involve only the skin or extend 6 mm (¼-inch) into the flesh depending on the variety. Scald can be more severe on the greener side of the fruit. There continues to be much debate about the cause of storage scald in apples, but most agree that storage scald is a type of chilling injury. The general theory is that alpha-farnesene, a naturally occurring volatile terpene in the apple fruit, is oxidized to a variety of products (conjugated trienes). These oxidation products result in injury to the cell membranes which eventually result in cell death in the outermost cell layers of the fruit. Ethylene promotes the formation of alpha-farnesene and oxygen is required to oxidize alpha-farnesene to conjugated trienes. Both ethylene scrubbing and low-oxygen storage reduce the incidence of storage scald. The reasons for variability in susceptibility to storage scald among apple varieties is not known; however, the concentration of naturally occurring antioxidants in the apple skin has been investigated. These differences between apple varieties may hold the key to the cause of storage scald. For many years, proper harvest maturity, ventilation in cold storage and 15% mineral oil wraps were the only methods available for scald control and control was incomplete. Mineral oil wraps were shown to absorb the volatile alpha-farnesene and ventilation also prevented accumulation of alpha-farnesene in the storage room air. Today, the most common method used to control scald is application of an antioxidant immediately after harvest. Diphenylamine (DPA) is commonly used. Ethoxyquin is also effective for some varieties, but can cause damage to some apple varieties (check labels for recommendations). Antioxidants should be applied within one week of harvest for maximum control. Wait 16 hours after DPA application before cooling of fruit (unless bitter pit is of great concern as cooling delays can increase bitter pit incidence). Low oxygen controlled atmosphere storage can provide a non-chemical control method in some cases. Oxygen concentrations between 0.5 and 1.0% can significantly delay the development of scald, perhaps up to 10 months. Fruit tolerance to such low oxygen levels as well as their effectiveness for scald control must be tested prior to use. Ingle, M. and M. C. D'Souza. 1989. Physiology and control of superficial scald of apples: a review. Hort Science 24:28-31.